Every athlete is different, so the right track and field training strategy would also be different. There is no absolute best when it comes to training athletes for track and field events. 1. When you start practicing, make sure you warm up by doing some stretching exercises. If you don’t go for a proper and well-planned warm up routine, you will face muscle pulls along with other injuries that might ruin your performance. A proper warm up also raises the core temperature of the body which increases the elasticity of the muscles which then reduces the risk of muscle pulls and strains. A good warm up also improves blood flow to and from the heart - this is needed for peak performance. Even if the session is technically based and less physically intense, you must never skip out on warming up. Warm up is a very important aspect in the execution of a workout session, so it must be done even if the exercises are very light. 2. Many track and field training sessions are physically demanding, and they involve weight lifting, running, or flexing exercises. Success cannot be achieved without hard work, but you must take care not to overwork to the point where the chances of injuries become high. Over working is bad for the body. If you are ever in doubt, take the easy route and reduce the workout volume, in this instance less is more. It is best to be 100% healthy and 80% in fit rather than having the reverse. If you are 80% healthy, you cannot compete properly. Always aim to stay 100% healthy even if you are not quite as fit as you want to be. 3. When you are planning a series of sessions, try to alternate a light workout one day with a physically demanding workout the next day. This will reduce the chances of getting overworked, thus lowering the chances of injuries and it also allows the body to recover more completely from the harder workout. 4. Track and field training should be done in such a way that it prevents injuries. Injuries can be due to many reasons. Though many are due to accidents which are outside your control, however, some of them are caused because of either improper or incomplete warm-up, athlete’s lack of knowledge about fitness, or overwork. To avoid these injuries, it is important that everything is taken into consideration and not left to chance. 5. Have a cool-down session at the end of training is the most important element at the end of a training session. Sometimes athletes skip the cool-down in favor of extra training. This is always a bad idea. The harder the training session the more important the need a good cool down. It helps to bring the heart rate back to normal, eliminate exercise by produce and relax the muscles. 6. Plan your training sessions and stick to the plan (bar injuries of course). If you plan to do 3 workouts per week, make sure you do 3 workouts per week. Consistency is the key to long term improvement. The adage if you don’t use it, you will lose it is a real concept in the world of sport training. In the end if you do not practice, you cannot improve. 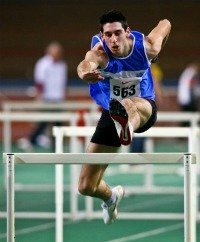 From "Track and Field Training Tips" To "Faster, Stronger, Better – Your Shortcut To Improved Athletic Performance"